After reviewing these, I was so impressed with their night vision performance that I decided that I just had to take them on a safari holiday with me. For me the amount of weight and space that they took up in my hand luggage was well worth it and this was despite the fact that I was already taking another full size pair of binoculars, my camera, tripod and a video camera with me! Built like a soviet tank, these Gen 1 night vision binoculars come with a powerful (for a night vision device) 3x magnification and large 50mm objective lenses, their Built-in IR illuminator also means that they can be used in complete darkness. The Luna LN-PB3 binoculars have a built-in accessory slot on top of them where you can mount the Luna Optics LN-ELIR-1 laser illuminator. This is a much more powerful illuminator than the built in one and is actually capable of resolving targets at an incredible distance of 800m. So if you are going to get these night vision binoculars, I highly recommend that you also add the LN-ELIR-1 to your shopping basket as the difference they make is incredible. Overall the build quality was very high and I would say that these binoculars are ideal for most home security needs, camping trips and most night time wildlife observation. 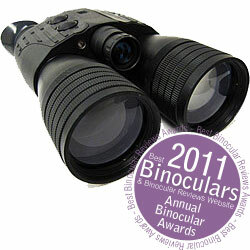 Go to http://www.binocular-repairs.com/shop-night-vision/ to see more of the Luna Optics range.